How does Photovoltaic Cell Work? Working of Solar Cell. If you happen to live in a region where Ra (the name for Ancient Egyptian Sun God) bestows full grace during most parts of the year, then certainly you do not need to imagine the ferocity of heat present in the rays of Ra. For others they can intuitively imagine (Eskimos might require special imagination skills though) that since heat is a form of energy why not convert it into some more useful purpose rather than utilizing it solely for natural tanning purposes. Perhaps this is exactly what went through the minds of scientists and researchers who came up with the concept of a solar cell. Before we study the solar cell it would be helpful to understand a phenomenon known as the photovoltaic affect. The photovoltaic effect or Hertz effect as it is also known; is the phenomenon of conversion of light energy by an appropriate material and its conversion into electric current. The material should be a semiconductor and it should be doped to increase conductivity. When the photons of light are absorbed by the material the electrons are released by gaining energy more than the energy required to jump the forbidden band, generating a corresponding hole. These free electrons and holes are responsible for the set up of an EMF and consequent flow of current through the load. Hence if you do not want to consider the details, just imagine the photovoltaic effect as being responsible to generate electricity out of light. 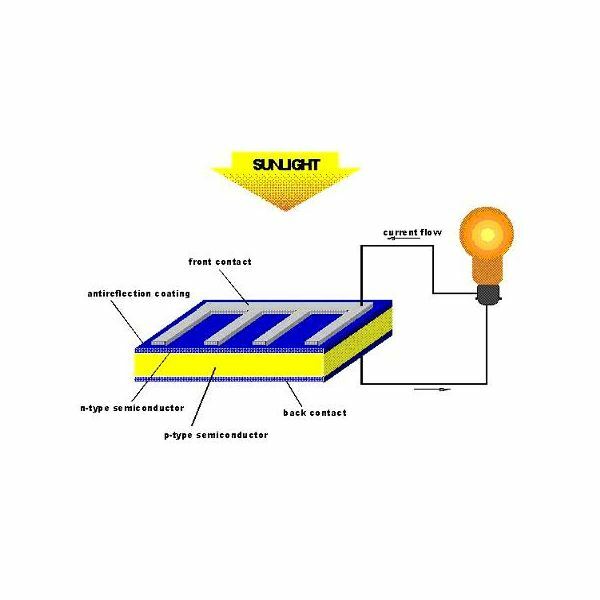 As the sun is a continuous source of light (most times of the day subject to weather conditions of course) it means that it can be used as a source to generate electricity and this is the basic principle behind a solar cell also known as the photovoltaic cell as we will see below. The photovoltaic cell or solar cell is a device which uses the photovoltaic effect described above to generate electricity through the use of the naturally available sunlight. Basically it consists of a series of semiconductor material plates which generate electricity which can either be stored or used to drive the required load. The image below shows a simple setup where an electric bulb is lit through the use of the solar cell when sunlight falls on it. . The various components are clearly labeled and the diagram is fairly self descriptive. One major issue with the use of solar cells is the high initial cost although costs have declined greatly as compared to the initial days of the solar cells with the advancement in technology and mass production. Another obvious drawback is the reliability when depends on natural factors and hence not within the total control of human beings. Yet this problem can be minimized by using the solar cell setup not independently but integrated with a grid which draws power from other sources as well.